I'm required to be at work full-time starting Monday, so I took the opportunity to get into the woods for a couple nights this past week. I decided to do a little exploring, and to drop by a location where I got some knocks last fall. 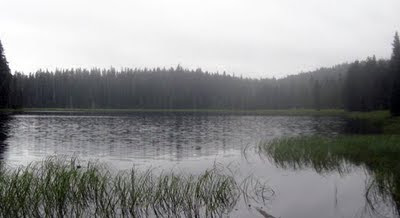 I started my two-night adventure by trying to get to Dinger Lake in Mount Hood National Forest. I've never heard of anyone camping at Dinger Lake, so that seemed pretty promising, and the forest service map indicated that a road would take me to within a mile or less of the lake. The road I chose to get there was a rough, rock-strewn mess in several spots, and one obstacle put me in danger of getting my truck high-centered. Soon after the roughest spot, I had to use my hatchet to chop through a small tree that had fallen over the road blocking my path. Not long after that obstacle was overcome, the road petered out and disappeared. I chose that spot for my campsite rather than driving out and looking for another way to the lake. I was still close to a mile from the lake with dusk just starting to settle on the forest, so I decided to wait until the next day to hike down the the water. That night was spent setting up a humble camp, deploying game cameras, and finding wood for a fire. I don't always camp with a fire. I find them to be loud and needing constant attention, like a bad date. That night, I definitely wanted one because it looked like there was some precipitation coming my way and I thought it'd be nice to warm up before the rain hit. No bigfoot activity was noted that night. It rained quite heavily that night, and I woke up with a small puddle of water near my feet. I could have easily avoided this by inspecting the rain fly on my tent, but my mind was elsewhere. The rain had stopped, but had given the forest a lovely smell and a crisp feel to the air. 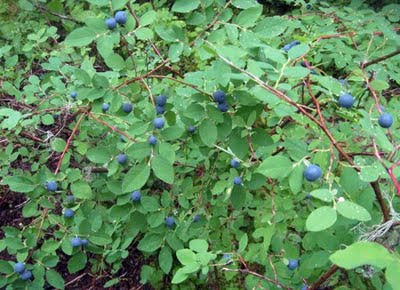 That is my favorite type of hiking weather, so I put on my rain pants and walked cross-country down to the lake, picking fresh huckleberries for my breakfast as I went. After collecting the trail cameras and packing up my gear, I drove out of the area and made my way to Frying Pan Lake. I paid a visit to Frying Pan Lake last fall where I received an excellent knock near 2 am. Before the knock, I had been making unusual noises with a musical whistle in the meadow for nearly 45 minutes. There wasn't much food around last fall, but there would certainly be a lot more now. I found Frying Pan Lake to be empty of people, so I set up camp. I deployed two game cameras in the woods on either side of the lake, and saved my other ones for the road and for monitoring the camp after I go to bed. Both cameras in the woods had attractive looking apples nearby, as well as scent lures. 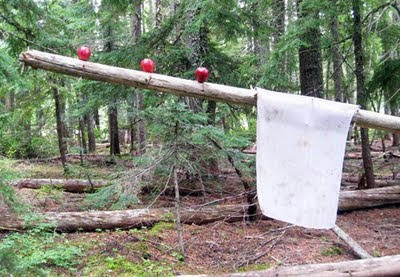 One of these apple offerings had a rag soaked in mouthwash hung in a tree. The slight breeze dispersed the aroma very efficiently, and the apples were prominently displayed well above ground level. This experiment yielded no positive results, but things like this are worth a try. I know a researcher that has had positive results with a rag soaked in Aqua Velva... I love thinking outside of the box. My artful display of yummies and smellies. Trying to learn from my past experiences of missing recording opportunities, I decided to set up my recording gear well before dark. Standing up to get my gear ready, I absent-mindedly gave a loud "whoop" to listen to the fantastic acoustics of the area. To my surprise (and slight dismay), it was immediately answered by two distinct knocks from the southeast. When will I learn? Shortly after the knocks as I was messing with the microphone, a slight noise caught my attention and I turned to find a large doe walking literally 15 feet from me through the middle of my camp. That was a surprise, perhaps for both parties. She looked cautiously at me and slowly walked off. 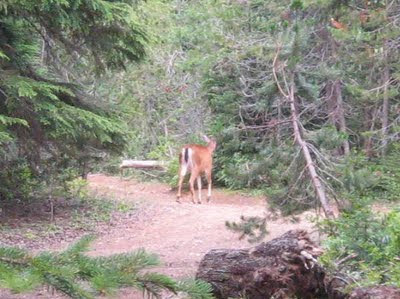 I managed to get one photograph of her as she made her way off to wherever she went. There was plenty of food around for a bigfoot. While walking around the lake looking for impressions, I found a nice trail of barefoot human prints that had me going for a moment. The context of the prints, as well as some anatomical details indicated that they were of the human variety: there were boot prints paralleling the trackway, the foot's arch was evident in several impressions, and the 5th digit (the pinkie toe) was curled under on all the prints, rather than showing signs of flexibility as one would expect from juvenile sasquatch prints of this size. I considered casting a couple for practice, but chose not to until I replenish my Hydrocal supply. I found the track-maker's prints in several locations around the circumference of the lake which made me think of how many times I've heard other bigfoot investigators say things like, "nobody would be walking there," or, "who would walk through mud like that?" Obviously somebody is. 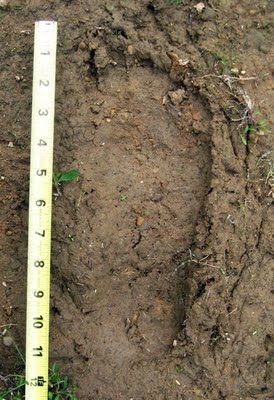 I would encourage bigfooters to look at the footprints themselves rather than suppose that people do or don't go to certain places. It seems a little too subjective. An excellent track, though human. A little later in the evening, two cars drove by, made contact with me, and camped nearby. I told them I was a bigfoot guy, so if they hear screams from my camp, everything's OK. The two men I spoke to seemed interested enough and invited me to their camp for a beer later in the evening. Apparently, one of the other guys who was camping with them got started a little early. Only 45 minutes or so after they showed up, one guy started yelling most of his conversation. This wasn't the normal, "I'm drunk so I'm talking loud because I don't realize it" sort of yelling. I mean, this guy was screaming to the point of his voice breaking from the stress. It was a caliber of yelling that one rarely finds in a conversation unless someone is in immediate danger. I don't think the man understood the fantastic acoustics of the area, since much of his noise was directed at heckling me and the idea of bigfoots. He probably didn't realize I could hear most of the conversations had at their camp. To their credit, the man's friends tried their best to be respectful and quiet him down a little, but the loud guy would have no part in it. At one point, the loud guy said the "F-word" for nearly 30 seconds straight. I wonder why? I just chose to play my guitar and ignore it as best as I could. I went through several emotions listening to the loud guy that night. At first, I was a little annoyed, then it changed to a brief period of me being a little mad about losing the opportunity that was presented by the knocks heard earlier, but then, my mood changed to astonishment where it still remains. Maybe it's my age, but I find it flabbergasting that a person of any age could sustain the energy that this man displayed for so long. He was in the mode of being a screamer for nearly three hours. You try screaming at the top of your lungs about anything for 15 minutes, let along three hours. I abandoned my strategy of making calls and knocks that night. I did not want to the local bigfoots to catch on that my calls are not other bigfoots. Bigfoots are too smart to fool them too many times, and it was obvious there were humans around. I decided to let the loud guy do all the work. After all, he was drawing a lot of attention to the area, and bigfoots are curious animals. However, as far as I could tell, no bigfoots were around that night. The last thing I heard from the loud guy was him congratulating one of his buddies for vomiting as well as the loud guy does. The next day, after I collected my gear from the woods, I dropped by the other camp to comment on how hard they were raging, and received several apologies about their loud friend from the two guys I spoke with earlier. I honestly didn't mind so much. After all, it's their national forest too. 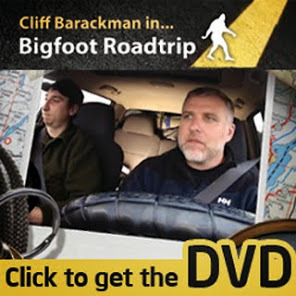 One of these men even went on to contact me through my http://www.northamericanbigfoot.com/ email address to offer further apologies and to encourage me on my search for the critters. They seemed like genuinely nice guys who were interested in the topic. One of their buddies just had lots of extra energy and a ton of beer. Most of us have been somewhere like that at some point in our lives, so being forgiving of such jackassery isn't too hard. Back at the truck, I took down camp and gathered my gear. 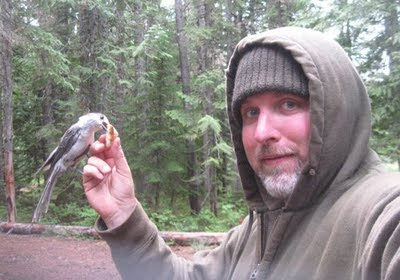 I shared my breakfast with a few feathered friends that were giving me the eye, and left for home. Enough breakfast for two, or a whole flock. While only those two possible knocks were indicative of sasquatches possibly being around, it was still a good trip. I have yet another location to explore (Dinger Lake), and enjoyed (nearly) two days of quiet solitude. Bigfooting is mostly camping with a purpose, and I love to camp. I'll be out there again soon, for the love of it. Nice write-up, Cliff. It shows one reason I love looking for this big guy myself. Even when nothing bigfoot related happens, and most of the time that is the case, you have had an adventure. Life is far too short not to have some adventure, in my opinion. Well written. I admire your patience, not only with squatching, but with the drunk guy. "Jackassery" what a great word.